Free Shipping Included! 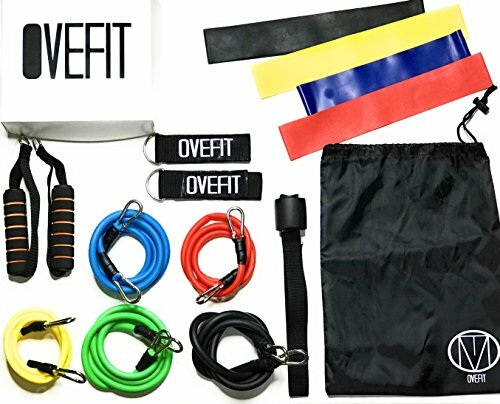 Resistance Band Set Workout Bands - Professional Quality Set of 15 Pieces - Carrying Bag, Door Anchor, Handles, Ankle Strap for Legs Workout, Resistance Bands, Loop Bands. Exercise Chart Included. by Ovefit LLC at Strongman Pictures. Hurry! Limited time offer. Offer valid only while supplies last. ADJUSTABLE RESISTANCE: Resistance Loop Bands - Yellow ( light 10lbs), Blue ( medium 20lbs), Red ( Heavy 30lbs), Black ( X-Heavy 40lbs). Resistance Bands - Red ( 6-8lbs), Yellow ( 9-11lbs), Green (12-14lbs), Blue (15-18lbs), Black (22lbs). BEST QUALITY: Our bands are made with 100% premium latex and thread count Nylon which provides high quality and durability. PHYSICAL THERAPY: Trainers use our bands to create effective fitness & weight loss programs for their clients. Perform low-impact exercises that can help you during physical therapy and recover and rehab from injury. Perfect for both men and women of all fitness levels and ages - beginner, intermediate or workout pros. SUITABLE FOR EVERYONE - Great for women and men of all fitness levels. Each exercise band offers a different level of resistance to work muscles throughout the whole body progressively and safely. Use the resistance bands for legs, arms, back, ankles, hips or shoulders with any one band individually or multiple bands together to provide the right level of resistance for you. Waterproof Carrying Bag, Set of 15 Pieces. If you have any questions about this product by Ovefit LLC, contact us by completing and submitting the form below. If you are looking for a specif part number, please include it with your message.